APOPO Mine Action Workshop and 17th State Party Meeting in Geneva. APOPO’s Mine Action team gathered in Geneva, Switzerland from the 24th to the 30th of November for a two day Mine Action workshop followed by the 17th Meeting of the State Parties, which brings together the 164 nations supporting the Mine Ban treaty. APOPO had a strong and visible team at the event and it’s clear that APOPO is growing a positive reputation in the industry and is recognized as a credible option for collaboration and partnership. Productive meetings were held with various other organisations and key players such as Mines Advisory Group (MAG), the Halo Trust and Humanity Inclusion (HI) as well as the Geneva International Centre for Humanitarian Demining (GICHD) to discuss building potential partnerships and expanding or beginning new projects. APOPO’s Head of Mine Action, Håvard Bach, also presented APOPO’s work and humanitarian demining programs at the side events of Zimbabwe and Cambodia. 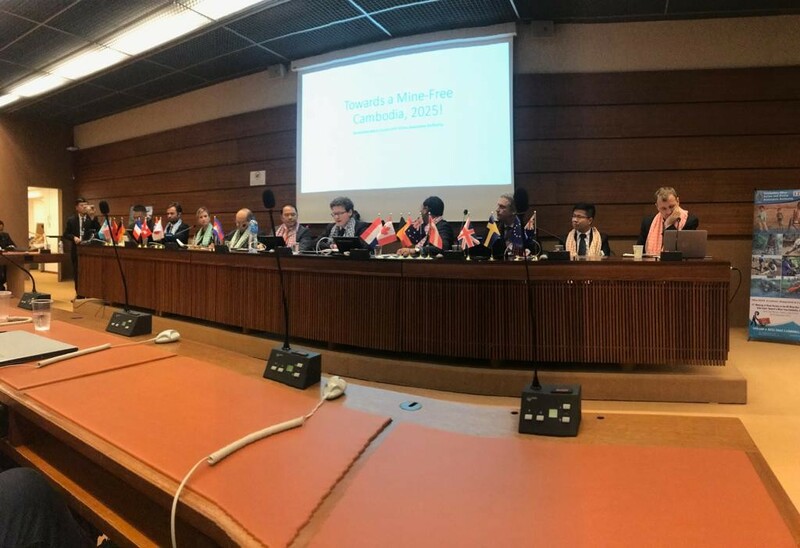 The Anti-personnel Mine Ban Convention (APMBC) adopted the goal to “accomplish all outstanding obligations under the Convention, to the fullest extent possible, by 2025”. This is for the most part achievable if states, donors and mine action organisations give it the priority it deserves and continue with higher levels of funding. Many challenges came out of the meeting. Afghanistan (chaired the Convention in 2018), called on the Parties to actively recognise the increasing threat of improvised anti-personnel mines, mostly in use by armed non-state actors, which has driven up the global figures of casualties. 34 countries have not yet ratified the Convention. Combined six of them – China, India, the Republic of Korea, Pakistan, Russia and the United States – may hold tens of millions of stockpiled antipersonnel mines. All of these but Korea and Russia attended the Convention as Observers and have expressed agreement with the Convention’s humanitarian objectives. The United States is the largest mine action donor in the world. There were also some successes - Mauritania declared that after nearly two decades of work (and four decades since these weapons were laid), it had cleared all its known mined areas. APOPO, through its mine detection animals, is committed to clearing landmines and releasing land at an accelerated pace, helping to protect more people and ensuring that children can grow up in a safe environment. Yet the need for protection against landmines is not unique to humans. Mines are also found in isolated areas where endangered wildlife roams. APOPO’s Zimbabwe program is located in a wildlife corridor and designated conservation area and it aims to protect wildlife as they move from one protected area to another. Our efforts ensure the protection of civilians and animals and support peace building and development in mine affected areas. Integrated Mine Detection Rats teams can triple the overall efficiency of a land release process compared to manual mine clearance used alone. Through partnership with other mine action organisations, we hope to ensure a much wider deployment of rats into more mine affected countries. APOPO is most grateful for the support and generous contributions of its partners and donors.